Traverse City could achieve its goal of powering all city operations with 100 percent renewable energy by 2020 ahead of schedule, thanks to proposals coming forward from multiple companies looking to sell the city renewable energy. Traverse City Light & Power (TCL&P) board members will consider offers from two such groups at their Tuesday meeting at 5:15pm at the Governmental Center. One of the companies, Heritage Sustainable Energy, struck a deal with TCL&P earlier this year to build a one-megawatt solar array at the corner of M-72 and Gray Road and sell the solar power produced to the city. The deal locked in a 20-year rate of 11.25 cents per kilowatt hour for TCL&P and brought the city nearly a quarter of the way to meeting its renewable energy goal. Part of the agreement terms allowed for future expansion of the solar array – a project Heritage is now ready to undertake. Owner Marty Lagina is planning to construct additional panels capable of producing up to 2.25 more megawatts of solar power in spring 2018. TCL&P can buy all of that power at an estimated cost of 9.95 cents per kilowatt hour, or roughly $49,000 per year. The arrangement would allow the city to take advantage of federal renewable energy credits and bring the city nearly 43 percent of the way toward meeting its 2020 goal. Lagina is also offering to use the expansion to help city residents who can’t afford to pay their electric bills receive aid through the Father Fred Foundation. For the solar power purchased through the expansion, TCL&P would pay 98 percent of costs to Heritage and two percent of costs to Father Fred, with the latter using the proceeds to help clients pay their electric bills. “Heritage prides itself on being a good corporate citizen of Traverse City, and on behalf of itself and its employees, is happy to be able to help in this regard,” Lagina wrote in a memo to TCL&P Executive Director Tim Arends. In addition to offering to sell more solar power to TCL&P, Heritage is also proposing selling more wind energy to the city-owned utility. TCL&P already purchases 10 megawatts of power produced by five wind turbines on Heritage’s Stoney Corners Wind Farm in McBain (pictured). 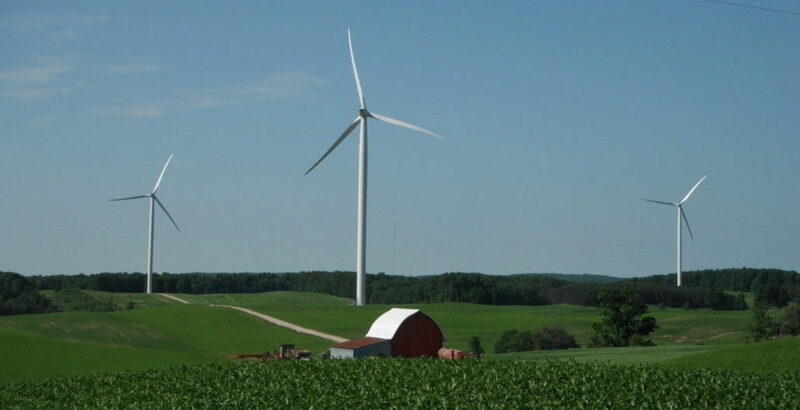 Heritage is offering to add two more wind turbines to the mix to sell TCL&P an additional five megawatts, or a total 15 megawatts, at a cost of 5.5 cents per kilowatt hour. Heritage could begin supplying the additional wind power as soon as January. If TCL&P were to purchase both the additional solar and wind power from Heritage, the city could “more than meet its goal of (using) 100 percent renewable energy by January 1, 2019,” according to Lagina. “The average weighted cost of this 100 percent renewable energy would be…7 cents/kilowatt hour,” or below the average market rate of 8 cents per kilowatt hour, Lagina said. Arends says Spartan Renewable Energy did not “provide a specific offer at this point” but may share more details on their rates at Tuesday’s meeting, which is a study session. Board members won’t take action on any of the proposed agreements Tuesday, but will instead provide direction to staff on how they want to proceed in preparation for a vote at a future upcoming meeting. Arends says there are multiple organizations the utility could work with to meet the city’s renewable energy goal, including the Michigan Public Power Agency (MPPA), and says meeting the 2020 deadline is “absolutely” achievable.